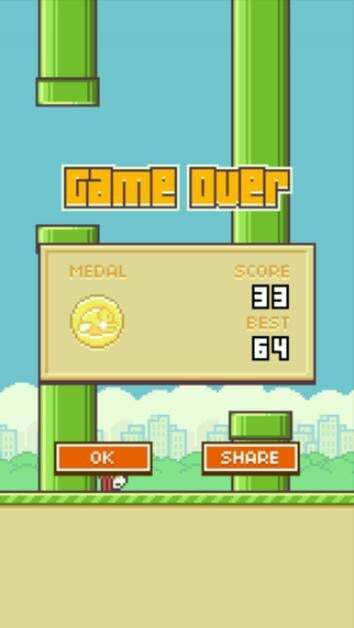 Flappy Bird online game: Why Dong Nguyen had to kill his perfect creation. How an amateur-ish iPhone game soared to such heights, and why it had to die. The world’s most downloaded game can be downloaded no more. This past weekend, 29-year-old Vietnamese game designer Dong Nguyen removed Flappy Bird from app stores, tweeting, “I cannot take this anymore.” The 50 million people who had already downloaded the improbable smash hit can still play it on their phones. The rest of the world’s billions will never know the exquisite frustration of fatally bonking the titular avian’s pixelated yellow head on a pixelated green pipe. The game’s spectacular ascent and abrupt demise have left questions floating like feathers in their wake. Who is Dong Nguyen? What, exactly, was it that he could no longer take? And, most puzzlingly of all, what made his distinctly amateurish game so wildly popular in the first place? Obscure when it launched last May, the game soared to ubiquity over the winter for reasons that remain opaque. By the first week of February, it had achieved heights previously touched only by major franchises like Candy Crush and Angry Birds. Not only was Flappy Bird by far the No. 1 free app on both the iPhone and Android app stores, but blatant rip-offs like Flappy Plane, Fly Birdie, and Ironpants bestrewed the top 50. Nguyen, the game’s creator, says he coded it over the course of a few nights after coming home from work. By last week, he told The Verge he was raking in $50,000 a day. Those who downloaded the app after hearing the hype might have suspected at first that they’d become the victim of a prank—the mobile-app equivalent of getting Rickrolled. The entire game consists of tapping the screen repeatedly in order to pilot said bird through the gaps between a series of pipes that look like they were ripped straight from the original Super Mario Bros. Touch one, and the bird drops dead and does a beak-plant. Game over. That’s it. There are no bad guys, no power-ups, no levels, no changes of scenery. The bird’s sole opponent is gravity. Its sole power is the ability to propel itself awkwardly aloft by a certain amount each time you tap. It sounds easy, right up until you try it. Unless you’re marvelously gifted, you’re likely to smack into the first pipe at least a dozen times before you achieve even the modest score of 1. And then you’re likely to do it a dozen more times before you get 2. Things do not get easier from there. You can waste days without reaching double digits. You can waste weeks without topping 25. To devote oneself to Flappy Bird is to know the abject futility of Sisyphus. All of which had millions of people asking the same question: Why, if the game was so awful, were so many people torturing themselves with it? A condition in the sense of a circumstance, but also in the sense of a blight, a sickness, a stain we cannot scrub out but may in time be willing to accept. A stain like our own miserable, tiny existences as players, which we nevertheless believe are more fundamental than the existence of bird flapping games or machine screws or the cold fog rising against the melting snow in the morning. Because the game cares so little for your experience of it, you find yourself ever more devoted to it. Bogost’s meditation on the game’s existential absurdity contains nuggets of insight, as do the more prosaic explanations above. The game’s popularity was jokey, it was a fad, it can be viewed as art, and part of its appeal did stem from its meaninglessness. But none of these explanations can fully satisfy, because they all begin from the same mistaken premise: that Flappy Bird is a bad game. On the contrary, Flappy Bird is an outstanding game. Indeed, it approaches the Platonic ideal of Game—an artificial construct in which participants divert themselves in the pursuit of an arbitrary goal while subject to arbitrary constraints that render the goal difficult to achieve. Flappy Bird is this, and almost nothing else. Do you play a game like Temple Run, Tetris, or BioShock Infinite? Shed your chains, step out of the cave, blink at the blinding sunlight, and as your eyes adjust, you will discover that you were playing Flappy Bird all along. What makes Flappy Bird so compelling? It’s not originality, certainly. Not only are the scenery and sound effects Mario-esque, but as many have pointed out, the game play owes a strong debt to forebears like Piou Piou and the Helicopter Game. Yet more than any of its predecessors, Flappy Bird supremely embodies a long-held tenet of good game design, best articulated in a quote widely attributed to Atari founder Nolan Bushnell in 1971: “easy to learn, difficult to master.” No game could be easier to learn than Flappy Bird, and yet mastery is elusive. On my third day of play, I scored 25, then 27, and rejoiced. Then my heart sank, because I feared that I had gotten so good that game play would soon become boring. On the next try, I plowed into the first pipe. Score: zero. I did not sniff the 20s again for another hour. But plenty of games fulfill Bushnell’s criteria. Flappy Bird rises above them thanks to another factor: its immediacy, rare in an age of increasingly narrative-rich and multifaceted electronic games. Tap the screen once, and you are thrust into the heat of game play. The first pipe is as treacherous as the 50th. Each one prompts an equal pulse of epinephrine through your nervous system. This is in contrast to the prevailing wisdom exemplified by Angry Birds and Candy Crush, which start off easy and therefore low-stress before adding layers of challenge. Flappy Bird is relentless from the start, almost comically so. Bogost seemed to view this as a deficiency, when in fact it’s the key to the game’s addictiveness. If Candy Crush is a designer drug, Flappy Bird is the pure product, uncut with additives. The average Flappy Bird game probably lasts less than 10 seconds. When you fail, you’re presented immediately with an invitation to try again. The slate is clean. The start button beckons. This could be the time you finally break your record, beat your friend, earn a virtual medal. The insidious part is that, because each game is so short, there’s never any significant harm in playing just one more. As with a lottery, the marginal cost of playing seems to pale in relation to the allure of the potential reward. You might well point out that there is no real reward for playing Flappy Bird—no monetary prize, no inherent value, and certainly no saleable skills to be gleaned. The game enriches no one but its mysterious developer. But that only makes it truer to the primitive spirit of gaming. A game that you play for the sake of real-world advancement is not really a game at all—it’s “gamification.” Real games are played to divert us from our workaday responsibilities, not pad our resumes or thicken our wallets. Nietzsche proposed that the struggle of maturity is “to recover the seriousness of a child at play.” Watch the face of a man playing Flappy Bird: beyond good and evil, indeed. None of this is to deny that Flappy Bird was a fad. Even if Nguyen had maintained it as his fans and critics demanded, its inherent rewards were sure to wear thin over time, along with its novelty. And its external rewards, such as they were—bragging rights, ironic bragging rights, the chance to be in on the joke—would have vanished as soon as the game was no longer cool. That people like Bogost and me were writing think-pieces about it for the Atlantic and Slate is probably a signal that its 15 minutes were almost up. Perhaps Nguyen sensed that. Some have speculated that taking the game offline was actually a brilliant marketing coup, because it imbued Flappy Bird with fresh mystique and drove millions more to download it in its final hours. Nguyen, meanwhile, will continue to pile up ad revenues from all those who are still playing the game. But even a cursory read of Nguyen’s Twitter timeline makes it clear that he is no guerrilla-marketing mastermind. Rather, he’s a young man who built a simple game that grew bigger than he had ever intended. And when it did, it brought on his head a level of fame, pressure, envy, and spite that he didn’t know how to handle. The cheerful innocence of his early tweets—“Wow, my game got in top 10 US free apps. Thank you, people.”—gave way to frustration and near-desperation as Nguyen tried to respond to requests for updates, complaints of bugs, accusations of plagiarism, requests for interviews, proposals of marriage, and blasts of vicious anger from people who felt he didn’t deserve the success he’d attained. Rather than sacrifice its innocence, Nguyen flew his creation into the proverbial green pipe. But its untimely death should not be allowed to overshadow its merits or the lessons it holds for the gaming industry. A game’s appeal is not proportional to its complexity. If anything, the relationship is inverse. Flappy Bird is a game like bouncing a ball on a paddle is a game. It is utterly simple, mind-numbingly repetitive, yet endless in its variations—and profound in its ability to fulfill our human need to concentrate for a moment, an hour, or an evening on something other than the weighty complexities of real life.